Access your landline from everywhere with the Cox Voice Everywhere app, your home phone away from home. With these innovative features, the Voice Everywhere app is compatible with any lifestyle. Switch your cell phone between WiFi and your mobile network, so you only use cellular data when necessary. Cox Voice supports up to four users on a call at once (5 when you include your home phone). Access your landline’s call history, contacts and voicemail everywhere. Download the Cox Everywhere app, sign in with your My Account login and start using your home phone everywhere. You'll use two screens to make calls: the Keypad and the Active Call Screen. This is the default screen when you open the app and where you make calls. e911 isn’t compatible with the Voice Everywhere app, so if you dial 911, the call will be made from your smartphone instead of from the app, and your location will not automatically be sent to the nearest emergency call center. *International Long Distance calling is not enabled on the Cox Voice Everywhere App. This screen will appear when someone is calling you, no matter where you are in the app. This screen shows you your voicemail log and allows you to delete messages. To delete a message, swipe left on the message and press "Delete". Or, simply tap a message and press the trashcan icon in the upper-right-hand corner of the screen. This screen lets you read and listen to voicemail messages. 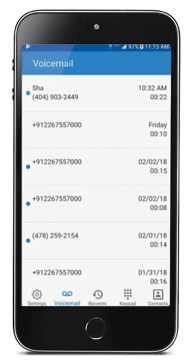 See a log of all calls you've made/received in the app or view missed calls. *This does not include calls made on your home phone or on another device. The contacts on your app sync with your phone's contacts (as long as you allow the app to access your contacts). Here you'll manage how your service works across your app and your home phone. How do I change my ringtone? The app uses your smartphone's ringtone. You can change it in your smartphone settings. How do I set up the Voice Everywhere app? Unfortunately, the Voice Everywhere app is not compatible with tablets at this time. What if there's an emergency and I need to dial 911? If you dial 911 from the Voice Everywhere app, the call will be placed through your smartphone's built-in call platform. e911 services are not available through the app. Can I change the ringtone? The app uses your native smartphone's ringtone, so you'll need to go to your smartphone settings to make changes. What if I have multiple home phone lines? When you sign in to the app, you'll have the option to select which phone number you'd like to use. Why am I being asked to allow the app to record audio on my Android phone? On Android phones only, this is the standard message that appears to give the app permission to use your microphone. Allowing permission enables you to make and receive calls. Is the app available with all Cox Voice plans? As of now, the Voice Everywhere app is only available with a Cox Voice Premier subscription. Cox Voice Starter and Economy customers will have access to the app at a later date. Can I use the Voice Everywhere app in other countries? For sure. Wherever you can connect to a hotspot, you can make a call using the Voice Everywhere app, as if you were calling from your home phone. Keep in mind that standard data and/or roaming charges may apply; check with your carrier. See Cox Digital Telephone service details. See important Cox Digital Telephone Power Outage usage information. See important information in the Residential Customer Service Agreement for full coverage details. See Annual Notice information for related information and your privacy rights as a Cox customer. For all Cox Communication policies regarding our services and business practices visit www.cox.com/aboutus/policies.html. Telephone modem is required and will be provided for the duration of phone service subscription. Upon disconnection of phone service, modem must be returned within 30 days or a monthly rental fee or lost equipment charge will apply. Modem uses household electrical power to operate. Telephone service, including access to e911 service, will not be available during a power outage without a backup battery or if the modem is moved or inoperable. New modem installs do not come with a battery. You may purchase a backup battery from Cox or, if you are a Lifeline customer, obtain a battery from Cox without charge. Purchased batteries are not required to be returned upon disconnection of service. You must monitor the health of the battery and replace it as needed (see cox.com/battery). Unlimited plan long distance minutes are limited to direct-dialed long distance calls within the United States, its unincorporated territories, calls to Mexico terminating on landlines and Canada, and require subscription to Cox for local, toll and state to state long distance service. Unlimited plan long distance minutes can be used only for residential, non-commercial voice calls and usage that is not consistent with such use may subject your account to review and/or suspension or termination of your service. Unlimited local calling with residential service plans is limited to the Cox Digital Telephone Starter, Essential, and Premier plans. If your area offers zone-based calling, contact your local Cox system for details on zones and rates. Phone service rates, terms and conditions are set by Cox tariffs, price lists, service guides and customer agreements as applicable and are subject to change. Bundle pricing requires purchase of additional services. Prices exclude taxes, surcharges and other fees including a monthly FCC access charge and Federal Universal Service charge. Service may require credit approval and deposit may be required. Installation charges and activation charges may apply. Service plans and prices shown are for flat rate service. Measured rate and Lifeline phone service are available in many Cox locations, contact us for details. To order other telephone services, please call our sales department. Other restrictions may apply. Telephone service is provided by an affiliated Cox entity.